This undated picture released by the SITE Institute shows Zachary Chesser standing in front of the White House. NEW: Chesser admitted posting show writers' addresses and urging readers to "pay them a visit"
Washington (CNN) -- A 21-year-old man who admitted posting online threats against the creators of the animated TV series "South Park" was sentenced Thursday to 25 years in prison. Zachary Adam Chesser encouraged violent jihadists to attack "South Park" writers for an episode that depicted the Prophet Mohammed in a bear suit, court documents said. He posted online messages that included the writers' home addresses and urged online readers to "pay them a visit," the documents said. "His actions caused people throughout the country to fear speaking out -- even in jest -- to avoid being labeled as enemies who deserved to be killed," U.S. Attorney Neil MacBride said. "The fact that a young man from Northern Virginia could support such violence and terror is a sobering reminder of the serious threat that homegrown jihadists pose to this country." Chesser pleaded guilty in October to providing material support to terrorists, communicating threats and soliciting others to threaten violence. The three charges carried a maximum sentence of 30 years in prison. "I accept full responsibility for all of my actions, and I would like to take the opportunity to express remorse," he said in court. 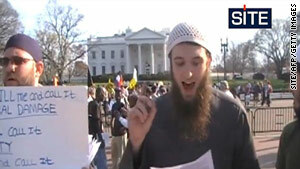 Chesser, who was born in the United States, converted to Islam in high school. U.S. District Court Judge Liam O'Grady told Chesser he had made a big leap from being a high school athlete to a traitor. Chesser also admitted that he tried to go to Somalia to join Al-Shabaab, an Islamic militant group that the United States considers a terrorist organization.